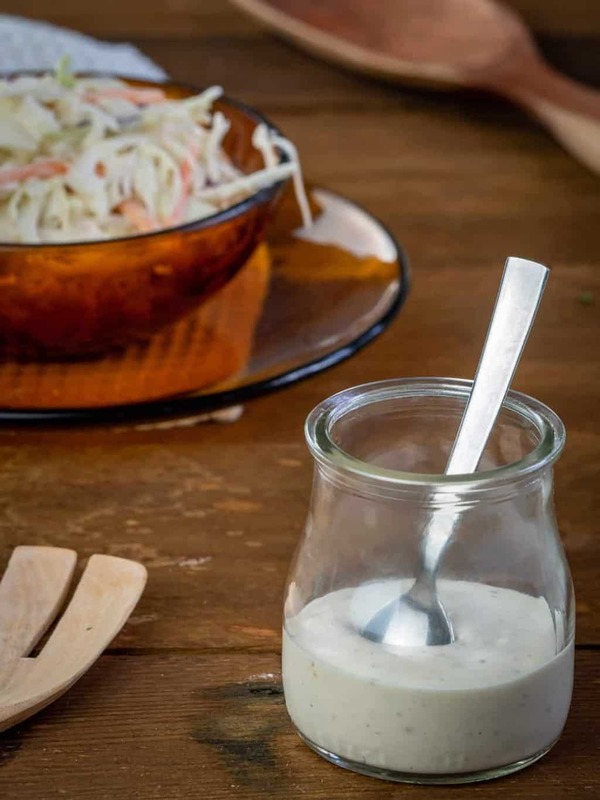 Coleslaw dressing is the delicious sweet and often tangy dressing that is mixed with shredded cabbage to create the yummy dish of coleslaw. Most coleslaw dressings are full of sugar, making them incompatible with a low-carb way of living. Making your own, instead of buying it, lets you customize it in ways you can’t do with the bottled variety. In the end, you’ll end up with a keto coleslaw that is delicious, sweet, tangy, and super satisfying! After you have these ingredients rounded up, you are set and ready to go! You might even have them already in your pantry just waiting to be used! Making this coleslaw dressing is incredibly easy! Using a hand mixer, mix all ingredients together until mixture is well incorporated and begins to thicken. Chill in the refrigerator for 30 minutes (or longer, if time allows). Combine with a homemade or pre-made (bagged from the grocery store) coleslaw mix and enjoy! WHAT KIND OF SWEETENERS ARE BEST FOR THIS DRESSING? Everyone has their own favorite sweetener they like to use in recipes. As we’ve mentioned before, different sweeteners can affect each of us differently. Having said that, there is more than one way to approach sweetening this dressing. Here are some ideas on different sweeteners you might decide to use in this recipe. Powdered erythritol is our sweetener of choice for this recipe. Why is that, you might ask? First, erythritol is one of, if not the best sweeteners for keeping blood sugar levels in check, all while being completely natural. Erythritol is a sugar alcohol that is 70% as sweet as sugar. Oddly enough, when erythritol is ingested, your body is unable to digest it. Therefore, it is removed by your body and excreted in urine. Basically, erythritol tastes sweet, all while having no effect on blood sugar levels when eaten. Unfortunately, this can’t be said about all artificial sweeteners. It also contains a mere .24 calories per gram, which is 6% of that of sugar. In most instances, erythritol is sold in granulated form. This means you have to worry about getting the erythritol to dissolve in the mixture (good luck with that…). Otherwise, you’ll have a very gritty end product. Even though erythritol doesn’t behave like sugar for cooking purposes, there is one way to aid dissolving it by turning it to powder. Powdering your own erythritol is very easy to do. In fact, we have an article that details just how easy it is to make your own. For this recipe, powdered erythritol can easily help strike the balance of “just enough” sweetness to tangy. Of course, if you are a fan of a sweeter coleslaw dressing, you can easily up the amount for a sweeter taste. Monk fruit is a close second in our list of favorite sweeteners. If you are a returning reader, you probably know we love Lakanto brand monk fruit sweeteners. Lakanto binds the monk fruit to granulated erythritol (see why it’s our favorite yet?) to create a product that is incredibly sweet, yet easy on our bodies. 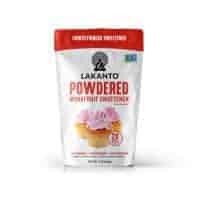 Since granulated erythritol has a nasty habit of not wanting to dissolve easily, Lakanto also makes a powdered version of their sweetener. The powder is very sweet, and a little can go a long way when it comes to sweetening a recipe. If you’d like to use this powder to sweeten your coleslaw dressing, we recommend starting with 1 tbsp and working your way up to your desired sweetness. Always remember, you can add more when cooking, but it is almost impossible to take away! There are, of course, a plethora of other sweetener choices on the market. In fact, you might have several different versions in your pantry right now. Using your favorite sweetener of choice is perfectly fine with this recipe, but there are a few things to keep in mind when doing so. What are the nutrition facts of this sweetener? If carbs are present in a serving, it’s best to not use it. Does this sweetener list maltodextrin or dextrose as an ingredient? If so, those are considered hidden sugars and can negatively impact your blood sugar levels. Is the serving size tablespoon or teaspoon? If it’s teaspoon, remember the company has no obligation to report any nutrition facts and might be hiding hidden sugars in the ingredient list. Have you been using this sweetener regularly? If so, have you been losing weight or have you been having lots of trouble with stalling? If you’ve stalled, chances are good the sweetener is playing a part. If the sweetener you want to use passes these “tests” and is something you like to use and works for you, then feel free to use it. On the flip side, if it fails any of these tests, it would be in your best interest to find an alternative that is more natural and better suited for ketogenic/low-carb eating. IS THIS DRESSING CONSIDERED VEGAN-FRIENDLY? Unfortunately, no it is not. A quick peek at the ingredient list will reveal the reasons why. However, if you know a way to make this recipe a keto vegan one, let us know what you did down in the comments! CAN I MAKE THIS WITH BUTTERMILK INSTEAD OF CREAM? Buttermilk is like any other milk and is full of carbs. In fact, buttermilk has 12g of carbohydrates per cup. While that might not seem like a lot, it can really add up on a carb restricted way of eating. Furthermore, buttermilk is the milk that is left over after butter is made, leaving it with a very low fat content. And, as you know, low-fat and keto don’t mix. Since the heavy cream has a much higher fat content, it is ideal for this recipe as it contains the fats necessary to be considered ketogenic. COULD I USE THIS FOR OTHER THINGS BESIDES COLESLAW? Though we don’t have experience using this as something other than coleslaw dressing, using it as a drizzle or sauce for other dishes is very possible. The first thing that comes to mind, though, is using this as a drizzle for steamed, baked, or fresh vegetables. In fact, using it as a salad dressing could even be a great idea. Coleslaw dressing drizzled broccoli and cauliflower anyone?! DO I HAVE TO USE VINEGAR? Simply no, you don’t. However, we like our coleslaw to have the slightest hint of twang, which the vinegar does a nice job of. If you’re one of those people that like your coleslaw extra tangy, then add more vinegar. However, if you’re one of those people who prefer your coleslaw to be sweet and creamy without any hint or taste of tang, then you can easily omit the vinegar from the recipe. CAN I USE SOMETHING OTHER THAN WHITE VINEGAR? If you have a favorite vinegar you like to use when cooking, feel free to use it. As a general rule, the “major” vinegars do not contain carbohydrates and are compatible with a low-carb lifestyle. These vinegars include apple cider vinegar, white vinegar, and rice vinegar. Vinegars such as red wine and white wine vinegar do contain small amounts of carbs and should be used sparingly. Regardless of the vinegar you are using, be sure to double check the ingredient label to ensure compatibility. Sometimes different brands will slip in unnecessary ingredients which will add to the carb count. CAN’T I JUST BUY COLESLAW DRESSING IN THE STORE? Well, you can, but then again, you’d be shocked at how much sugar is in a serving of ready-to-use coleslaw dressing. One of our favorite pre-keto coleslaw dressings had a whopping 7g of carbohydrates per 2 tablespoon serving. If you think of a daily maximum of 20g – 30g of carbs, that’s a ton in just two tablespoons! There are probably some brands that are a little lighter on the carb count, but they more than likely aren’t better by much. So yes, you can buy coleslaw dressing at the store, but it’s in no way, shape, or form keto or low-carb. And, you know exactly what is going into this dressing, whereas you might have to take a pronunciation class just to be able to read the ingredients list. If you’re one of those people who love your foods on the spicier side, you can easily add an extra kick to your coleslaw. You can finely dice some jalapeno peppers (or other hot pepper of choice) and mix them into the slaw after you’ve added the dressing to the cabbage. This will give a nice amount of spice, all while keeping the overall dish cool and refreshing. The other way you can add some spice is to add a couple dashes (or any amount until you reach our desired level of heat) of a no-sugar added hot sauce to the dressing. Mix in the hot sauce with the rest of the ingredients for a nice coleslaw dressing that is both creamy and spicy at the same time. Win, win! Have some keto coleslaw dressing left over and not sure what to do with it? Storing this dressing is incredibly easy! The best method of storing this dressing is in an air-tight container. More specifically, an air-tight container that the dressing can be easily poured out of. It might seem like an odd suggestion, but the best storage container for this is a good old fashioned Mason jar. These jars are easily sealed by simply putting on the lid and tightening the band. And, they provide a super easy way to pour the dressing out into your cabbage mixture. 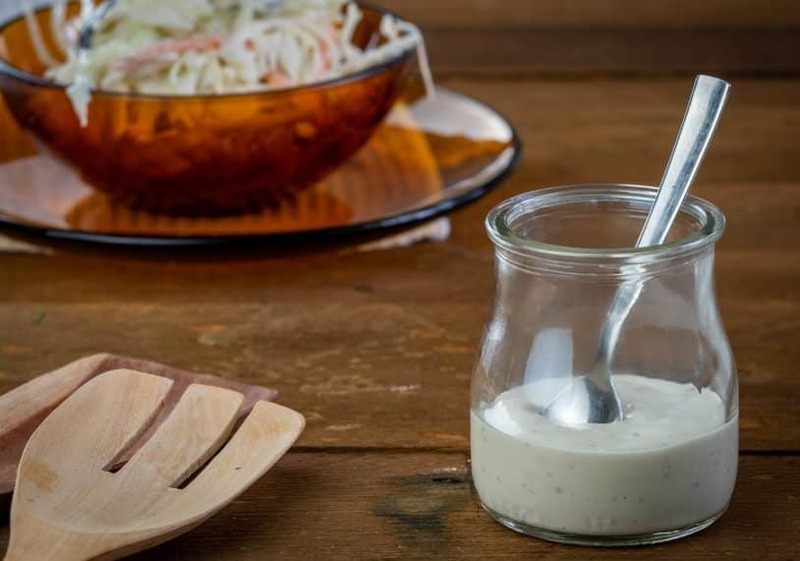 This keto coleslaw dressing will keep for around a week and a half, if you’re needing to keep some on hand. 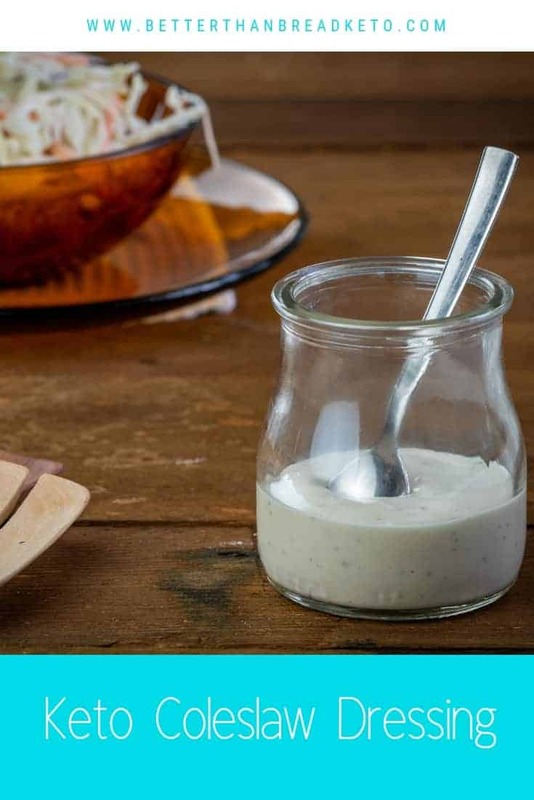 After that, it would be best to discard any leftover dressing, as erythritol (or any artificial sweetener) that is in a mixture too long can ruin the taste. It is best practice for something like this to make it just before using and have plans to use any leftover dressing within a few days. WHAT DISHES DOES THIS PAIR WELL WITH? 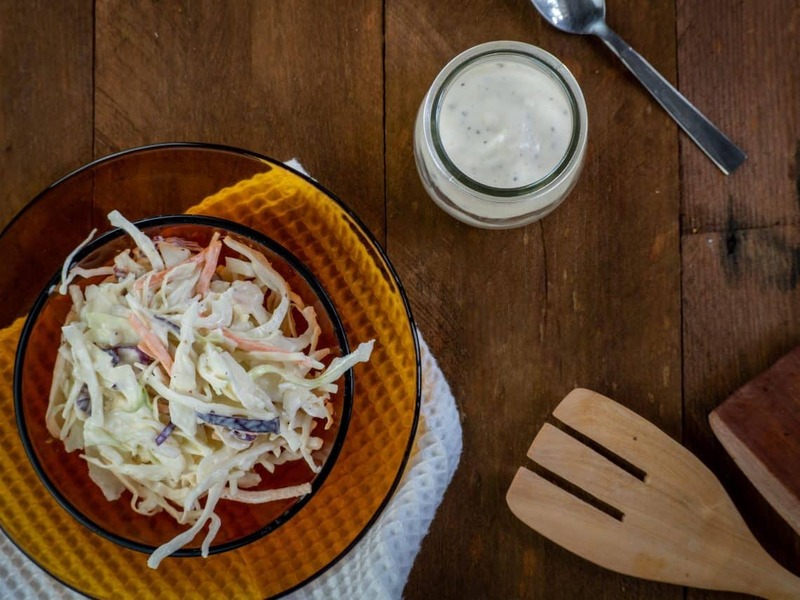 Coleslaw is a delicious side dish that is suitable for eating any time of the year. Of course, it is most popular in the spring and summer months, but that shouldn’t stop you from eating it whenever! There are lots of great main courses this would pair well with. It goes especially well with “picnic” and “cookout” foods, but there are plenty of other good combinations. For more ideas, you can check out our recipe index, or check out all of our main course recipes. 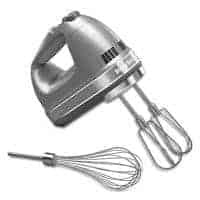 Hand Mixer – We’ve said it before and we will say it again. A hand mixer can save you a ton of time in your kitchen. Using a good old fashioned whisk and elbow grease might make you feel like an iron chef, but there’s really no need in doing all that work when the magic of a hand mixer is all you really need. Otherwise, combine with a homemade or premade (bagged from the grocery store) coleslaw mix and enjoy! Looks delicious, but I am watching calories to stay below 1,200. How much is one serving and calories in one serving? Thanks. A serving works out to be right around 2 tablespoons. The calories and other nutrition information are listed in the nutrition facts section on the recipe page. This recipe is for the coleslaw dressing to go on your favorite slaw base. We’ve seen lots of different slaw bases recently, including broccoli and cauliflower in our grocery stores. We have updated the recipe to reflect using the dressing your favorite base since that wasn’t as apparent as it should have been.